If having fun when playing bingo is what you want, then try out the The Sun bingo app today. There is loads of players, loads of games, loads of tickets, loads of offers and bucket loads of fun! 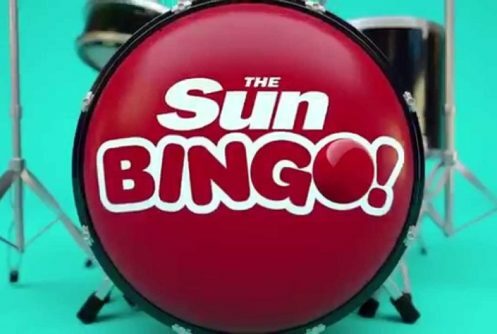 If you need a fun place to play bingo and you can’t make it to a bingo hall, why not try out The Sun Bingo app on your mobile or tablet. Bought to you by the world famous newspaper, The Sun have been providing bingo online for longer than you may think! 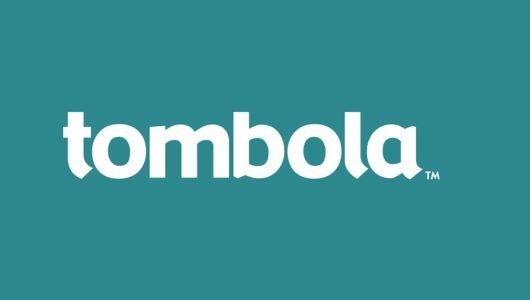 They have a very fun website and a super easy to use app that is available on all mobiles including Android and iOS (iPhone, iPad & iPod) devices. The Sun bingo love having new players and to show this, they normally have a very good new customer bonus available at www.sunbingo.co.uk This bingo operator runs several promotions and offers and it is best to check on the mobile site to see the latest ones available as they do change frequently. The newbie bonus doesn’t stop there, you can also play in the ‘Learner Room’ for a full 7 days following registration. The room is open from 11am to 1pm and then again from 6pm to 8pm. In here you can play free bingo, meet the chat moderators and mingle with lots of other newbies. The app is available for both Android and iOS (iPhone & iPad) powered mobile devices and the process of downloading and installing is similar for the two operating systems. The Sun also have a HTML5 web based app that means older Blackberry and Windows mobile devices can play on the mobile site. Some users prefer to play on the mobile site rather than download an app. Wherever you prefer to play is fine with us and you get the same games and experience on both. Players using iOS powered devices, like the iPhone or iPad can download the app by heading over to the iTunes App Store. Join on the mobile site where you can get your bonus and log in details at www.sunbingo.co.uk once signed up, you will be asked if you want to download the app, click yes and you will then be redirected over to iTunes. 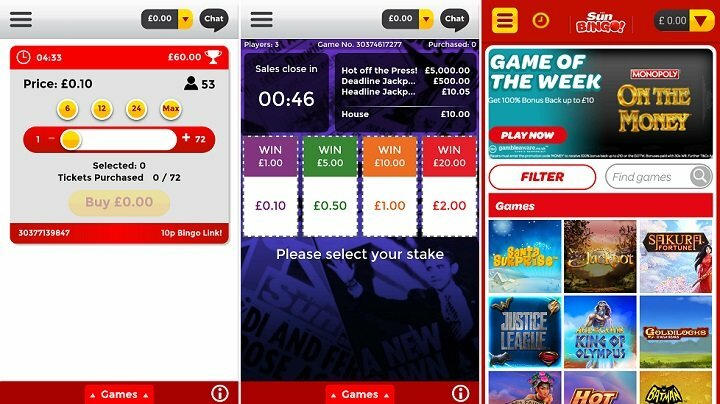 Android users looking to download the Sun bingo app will need to go to www.sunbingo.co.uk register, then add the mobile site as a web based app. To do this, click on the 3 buttons in the top of the browser and then find and tap Add To Homepage. Now you can add a quick link to your new favourite bingo site. There is not yet a downloadable app for The Sun bingo for Android but we hope this changes soon. As soon as it is here, we will let you know and update our guide & review information. If you have ever read The Sun newspaper, you will know they are famed for their fun stories, cheeky headlines, glamorous ladies and a reputation for pushing the boundaries. Well it isn’t just the newspaper they do that with, they also do it on the Sun bingo app for Android, iOS and mobile. The app is a slimmed down, mobile version of their full blown desktop website which is one of the best looking, well designed sites we use to play on. The design is very modern and they use a nice red and black theme. 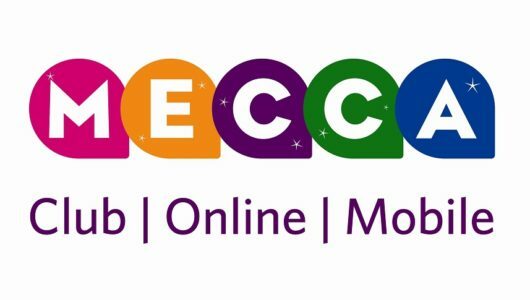 A well thought out menu slits the fun up in to sections as not only can you play bingo on the app, there is also slots, games and scratch cards too. 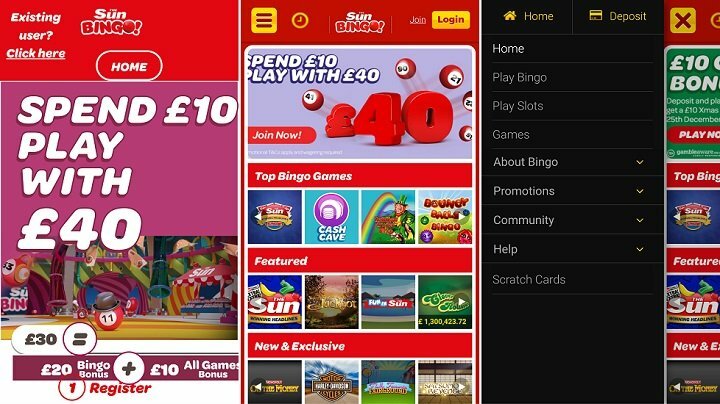 There is a great community of players on the app and The Sun bingo have thousands of loyal players who religiously play games there every day. When you launch the Sun bingo app for the first time, you will need to let the app or mobile site check your location. This is normal and most apps do this, it is so they know you are in a country where they operate. Once you have done that, you can go straight to the lobby on the app. This is identical on the the iPhone/iPad app as well as on the Sun bingo mobile app for Android and the web based version. The app really does look the part and has a nice layout and menu system in place so players can find games and play them easily. The lobby has the full list of bingo games available and you can narrow down and filter to find your ideal room. You can also scroll through the options using the menu at the top of the page too. On offer is an exciting variety of games, including 90 ball, 80 ball and 75 ball bingo. There is also specials available such as Deal or No deal bingo, bouncy balls bingo and Rainbow riches bingo to name but a few. A neat variation on the game which is also available on the app and mobile site (and also the normal website) is called Roll on Bingo. This creates up to 20 more winners and this feature means that once house is called the game keeps playing until all Roll On prizes have been won. You will never be short of fellow players using the app as the Sun have one of the biggest online bingo communities going. You will soon make lots of friends and you can chat to them too using the handy chat feature available. This is especially handy for newbies who are new to bingo as you can mingle and chat to other new players and get advice from experienced pros on their favourite games. There is also the benefit of BOGOF bingo where ‘You buy one, you get one free’. Yep it does exactly what it says on the tin, buy one ticket and get another ticket free. Playing bingo is only a small part of what you can do on the app. As well as classic and modern twist bingo games, you can also play on a range of exciting slots and games too, all from the one app and one account. The slots have some very familiar titles from some of the best and well respected games providers and you can find titles including Monopoly on the money, rainbow riches, action bank, pixies in the forest and fruity burst. These, like bingo can only be played for real cash, there is no play or practice mode at the minute. As well as slots, there is a games tab on the app that lets you play even more mobile casino games. All in all, there are over 100 titles to choose from and it’s a great little feature to be able to play along side bingo. If you ever need any help on the bingo app from the Sun, there are several ways to get support. You can email, call and there is also a live chat feature built in as well. Customer support is exceptional and should you have any issues, you can be sure the support team will do their best to help you out. How do you play bingo on the app? There are always lots of promotions available over at www.sunbingo.co.uk They normally do offer a new player bonus when you sign up with them and all of the details for these new player bonuses can be found on the website. In addition to this, there are lots of other promos and offers available all year round for existing customers, such as those below. It is always worth clicking the promotions tab when you are playing on the app, mobile site or website to see all the latest offers. Earn 100% bonus back from playing on your favourite games! 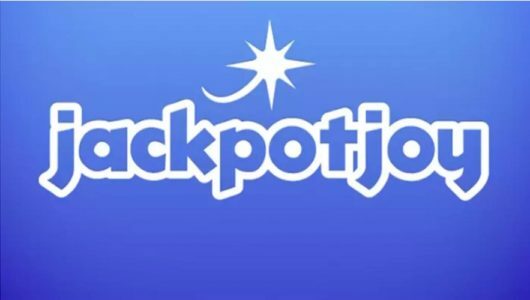 Keep the celebrations up with the £1M Escalator Jackpots. Every night, from 6pm. There’s £20,000 up for grabs for all the lovers of 75 Ball Bingo out there. Join the Glamour Room on the first Friday of the month from 6pm – Midnight. Join fellow players every Tuesday and Thursday from 8pm – 10pm where The Sun bingo have £1,000 cash in Free Bingo to give away in the Jazz Room. From Friday to Sunday each week, there are 30 chances to win £100. Pop in to the Candy Room from 8pm – 9pm to take part. Players can make deposits and withdrawals from their gaming accounts via the app, just as they would while on the normal website. The process of making deposits or withdrawals is far less complicated on the app as compared to the website and it’s really easy to do. To add funds, simply go to your account by pressing the button in the top right of the page with the arrow, or select deposit from the main menu. Select your deposit method (Credit Card, Debit Card, Prepaid Card (UKash) PayPal, pay.com, Skrill, PaySafe and Pingit) then its simple a matter of adding your card details or login details and selecting your desired deposit amount. To withdraw, go back to your account and hit withdraw. They can take up to 48 hours, but you can reverse the transaction if you wish to carry on playing.